Each piece of your business’s content, whether it’s a comment, an article, a photograph, a video or some other form of information, is competing with every other piece of content for your target audience’s attention. The challenge isn’t just for your corporate marketing (B2B, B2C, Not-For-Profit or small business) it’s also for family, friends, work colleagues and real life. Based on my experience in NYC, real life engagement may be declining since people walk and drive more focused on watching their small screens rather than what’s right in front of them. No matter how much content reaches your prospect, she’s only got a finite amount of time per day in which to consume it. As a result, we’ve created ways to scan, read or delete this information so that we’re not overwhelmed by it. Pull marketing: Attracts prospects to your business because you’ve piqued their desire to find out more, often through interesting, quality content. Push marketing: Drives people to buy from your company through paid methods like advertising and the use of price-based promotions and other inducements. BTW-Though it sounds similar, Pull Vs Push Marketing is NOT related to the Pushmi-pullyu (pronounced: Push Me, Pull You) in Dr. Dolittle. 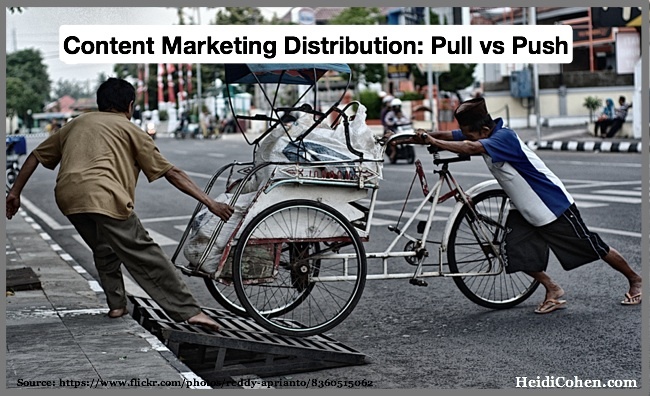 To better understand the various options here are the components of content marketing distribution: pull vs push. Social media. Applies to information placed on social networks where your business has a presence such as a Facebook Page. This information aims to engage visitors providing them with value not just sales promotions. Email content. Is information that the reader has signed up to receive because they love the content or wanted an inducement such as an ebook. This content should be promotion-free and provide value for readers. Referral marketing. Comes from trusted sources like family, friends and colleagues. It can be presented in a variety of formats, most notably social media, email or conversation. According to Keller Fay research, face-to-face interactions are the most frequent form of word of mouth. Ratings and reviews. Comes from other consumers in aggregate. Prospects trust it because it’s the wisdom of crowds. Amazon and TripAdvisor are prime examples. Search optimization. Refers to creating your content to attract people seeking information on a specific topic via a search engine. Product usage. Gets company visibility because people wear or use your product causing others to want your product. The use of logos, product design and shopping bags enhances the impact. Content curation. Presents your content and other people’s content in context to appeal to your audience. Upworthy and BuzzFeed are great examples. Co-created content. Is where two or more people, generally influencers, work together to create and promote content as epic content curation for an existing audience. It also includes interviews such as those on blogs, podcasts and television. Guest posting. Leverages other people’s audiences. The editorial team vets and copyedits the content for their audience. The author must get the content selected and created. Live events. Spread your content to an existing audience. The key factor: You must provide value to your audience in the form of training or entertainment. This includes in-store demonstrations and meetings. Social media advertising. Is paid promotion to support your content on a social network. Often social media advertising is laser targeted based on participant activity. It must be purchased separately by platform. Search advertising. Is paid advertisements on search engines, namely Google and Bing, to attract people seeking specific information. It requires additional budget to appear on mobile versions. Promotional email. Is email you’ve acquired legally during purchase or other process that you use to push your latest deals and promotions. Rented email. Is the use of a third party email lists to attract other buyers. It’s a form of paid promotion. Email advertising. Is the placement of your promotion on other people’s emailings. It’s like any other form of advertising. Third party advertising. Applies to a wide range of advertising including offline and digital content such as television, newspaper, radio, etc. This includes advertorials. Signage. Refers to the promotional signs and windows outside your place of business to attract prospects. It includes street signs and flyers to get people into your store. Influencer programs. Involve getting key influencers in your category or niche to support your product or services. These programs involve some form of exchange to persuade influencers to support your firm. Product endorsement. Is a specific form of product usage, often by a celebrity or high profile expert in return for a fee. Conferences. Involve placing your employees or promotion in front of a targeted audience in exchange for a fee. Most marketers find it necessary to use a combination of both pull marketing and push marketing. Pull marketing is more effective at drawing prospects in to your business because they’ve selected your content or it’s been referred to them by a trusted source. As a result, it tends to convert at higher rates. By contrast, push marketing tends to involve a payment for advertising to leverage someone else’s audience or reimburse the promoter. For further help, here’s a 37 step content distribution checklist. 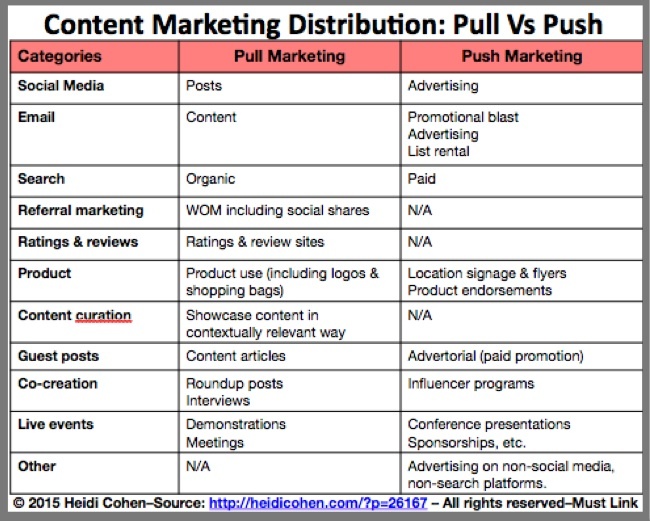 To maximize your content marketing distribution reach whether you use pull or push marketing, here are 5 actionable content marketing tactics. 1. Improve your content presentation. Make your content appealing and easy-to-read to pull more readers in. Use inviting photographs. People are attracted to visuals. Go one step further and make them shareable to extend your audience. Craft attention-getting headlines. Spend time perfecting your headlines since only 20% of people will read further. Make your content scanable. Use bolding and outlining to facilitate readability. 2. Get your employees involved in content distribution. Expand your reach by getting your entire organization into the act. Make sharing your content part of everyone’s job. People listen to other people, not companies. Create a set of social media guidelines. Let employees know what they can and can’t say about your firm on social media platforms. Make your employees look good. Help your employees improve their social media presence. Set up processes to let employees know when to share your content. Don’t assume everyone in your firm already knows about it. 3. Build your house file. Provide a series of “new member” emailings. Offer new registrants targeted information before you add them to your on-going mailings. Ask registrants to follow you on social media. Once they’ve shown interest in your content, get them to interact with you on other platforms. Don’t assume that people will take action. Guide them to the next action. Make it a small step. Don’t go for the sale. Instead encourage interaction. Go beyond vanity metrics. Measure how well your content performed in achieving your business goals. Monitor key metrics. Don’t wait to get a special analytics package. Instead, look at housefile growth, number of leads generated, sales closed and costs. Compare results to last year and prior period. Use actual results to monitor improvement, not just your budget. Regardless of which form you use, the bottom line is: no marketing is free. You need resources in the form of people and money to get people to buy from your business. BTW—Here are 35 ways to improving your content marketing in 2015. Which forms of content marketing distribution do you use and why? P.S. Don’t forget to get your marketing on track with the Ultimate 2015 Marketing Checklist. Tags Chart, Distribution, Pull Marketing, Push Marketing. Bookmark the permalink. What’s the best way to building a large twitter following? Posting informative tweets or paid sponsors? Good synthesis. I’m one to think that you describe a sophisticated machine but we now live in a networked world so a large portion of the content we consume is pushed to us by others…so distribution start first with the building and nurturing of a true network of relationships with like minded people. So for brands, to grow their influence, mostly through their employees as advocates as we don’t read much brand content on a daily basis. What I love about this post is, it’s a great way to talk about content marketing with those who think marketing is all about press releases and fliers.